How long do you think this job should take? 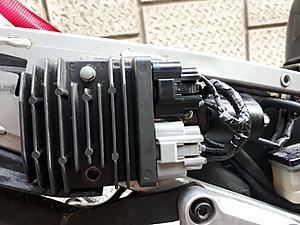 Taking off the rear cowl, fitting the the "new" rectifier, cutting and soldering, mounting everything back up? A DIY kit or parts you gather together... Depends on if you have the tools, ability, experiences and knowledge to crimp, soldier, visualize and assemble. I think it took me about an hour to make the first install......but Ive done stuff like this a few times. Last edited by E.Marquez; 07-21-2018 at 05:57 PM. Completely depends on how efficient you are with your time. Don't rush it, get it right the first time. Yup, the first time is not a good plan to try and do the install Sunday early before an afternoon ride with your buddies. Id do it mid week, and plan a few hours, no rush and no expectations to have it done that night.. If it is, great, if you need one more thing,,, thats why mid week and no need for it to be done in that single session. My parts look exactly like the OP on this thread- the connectors gutted in a plastic bag and the mosfet rectifier. I do have all the tools needed (or at least so I think), including one of those nice "automatic" wire strippers. With a few full car audio system installs done (multiple amps, DSPs, etc) and many car, motorbike and bicycle repairs I'm confident in starting this job (and not breaking stuff, and/or later catching fire from dodgy electrics). not a good plan to try and do the install Sunday early before an afternoon ride with your buddies. This is kind of what I had pictured (if the weather will be nice). LOL. Mid week was the initial plan, but it's been raining like crazy so it wasn't possible. I'm hoping that removing+installing the cowl will take 30 minutes, then soldering another 30 minutes, then reinstalling the rear top case arms (currently mounted with left and right inverted) another 15 minutes, so overall be finished under 1.5 hours. 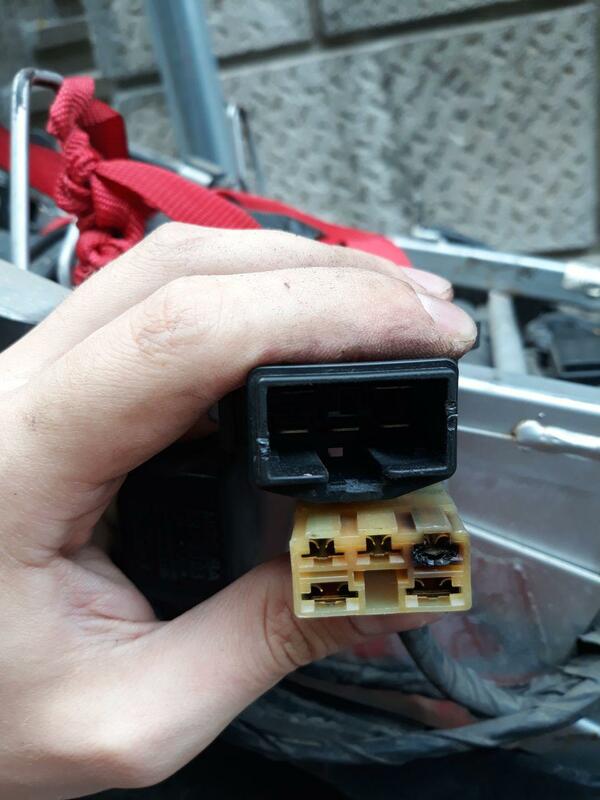 The terminals for Furukawa QLW-250 Series Sealed Connectors, for Shindengen Mosfet type Rectifiers can not be properly crimped with most any crimper you will find in a store... it takes a proper sized die and lots of leverage. You can kind of fake it with pliers and soldiering ..but then you loose the advantage of a solderless, rolled crimp for reliability over a ridged harsh edged soldered connection. As for getting to the RR... the rear cowl is pretty easy to remove, 4 fasteners, 2 on the side, 2 on the top rear under the seat. The 1.5h job took... 3.5 hours. Bye bye Sunday afternoon ride! To begin with soldering the wires was a nightmare. Firstly because the copper was a bit oxidized (used a ton of flux but didn't help much) and secondly because my 20W soldering iron wasn't enough- the pictures from the OP gave me the impression that the wires were thinner than they were (would have been quicker to go to the nearest store and buy a more powerful soldering iron). I'm not 100% happy with how it turned out, perhaps one day I'll buy another set of plugs and fully replace all the wires. Then I had to reroute the wires as I also had the "converter unit" which doesn't appear on the OP (perhaps the unit is only on 01+ models) and relocate the blinker relay. Couldn't fully test it (only ran it for half a minute) but overall I'm glad I did this job. Although the old rectifier gave good voltage, you can see in the picture that the plug (and wires) were already melted. I knew this was a ticking time bomb but didn't expect this! Got a 9 day trip planned for mid-August so I want the best chances of not breaking down 2000km from home. You were correct, my crimp tool wasn't suited for this. And I agree that improvised crimping + soldering isn't ideal, but considering the age and condition of the electrical system, there's still plenty left to fail before the new rectifier plugs. My bike is a 2000 so not sure what the 2nd gen's had back when I posted(they were my pics). I didn't really notice the soldering iron comment either or I might have mentioned it. I too started out years ago in car audio (still have a pretty elaborate multi amp/electronic x-over system) and still have a high quality Weller solder gun that had no trouble making they required heat. Hopefully yours is good to go. Well, it's live and learn... Had I checked the service manual, I'd have found out about the differences in wire layout on pre vs post '01 models. Finally got it properly tested- it 14.04 to 14.12V on idle and 14.18 to 14.22V from 2000rpm to redline. And after riding about 300km with the new rectifier (city riding and short trips), the battery (bought in 2016 according to the previous owner) now has a resting voltage (bike off) of ~12.6V (meaning 90-95% full), from ~12,4V with the OEM rectifier. Also, the voltage "recovery time" (getting back to normal after dropping after turning on a light) is a bit quicker. So overall I'm very happy I did this mod, thanks to everyone on this forum who contributed with the info!